This winter, enjoy our Early and Late Season Special Offers, to make the very most of the fabulous ski area of Sainte Foy Tarentaise. 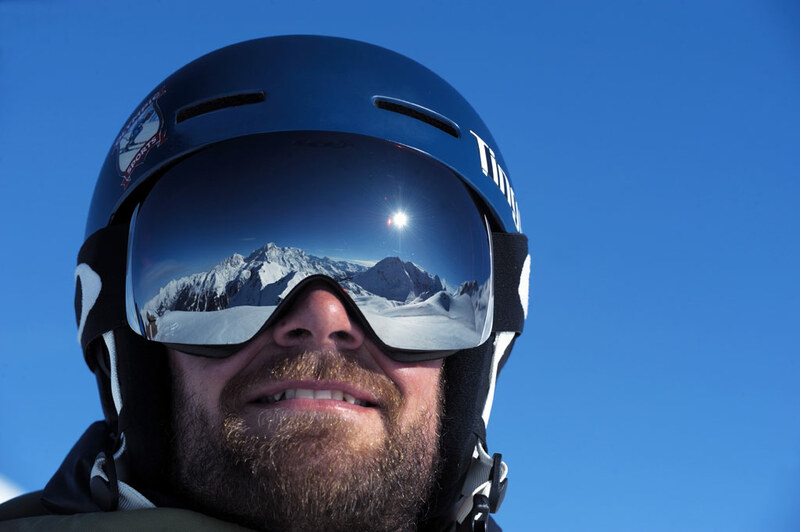 You can now book, buy, and recharge your lift passes on the Tourist Office website with secure online payment. Save time and hit the slopes even sooner! New! Ski Saturdays at €23. Are you skiing as a family? Throughout the season, you can enjoy a special package with lift passes for all the family (5, 6 or 7 days) at child prices! Enjoy a free half-day lift pass on your arrival day to discover the ski area before the rest of the world! Offer valid from Saturday 15 December 2018, with the first day of skiing between Saturday 15 December and Sunday 23 December 2018. Applicable to Sainte Foy Tarentaise 6-day lift passes. For example, when you buy a 6-day Sainte Foy Tarentaise lift pass starting on Sunday 16 December you can enjoy a free half-day of skiing on Saturday 15 December from 1 pm. For a perfect end to the season, come and enjoy the pistes of the Sainte Foy ski area with your kids, who ski for free! Valid from Saturday 6 April to Saturday 13 April 2019. Applicable to Sainte Foy Tarentaise 6 day passes. 1 paying adult = 1 free child. Please note! There is no shuttle bus or ski lift running between Villaroger / Les Arcs and Sainte Foy Tarentaise ski resort (8km) or town (2km). Student lift passes (€25.90 / day) for one day or a longer stay only on presentation of a student card. Children under 5 are offered a free lift pass, upon presentation of ID when accompanied by a skiing parent. This free lift pass is required in order to take the chairlifts. Skiers aged 74 and over can enjoy a free lift pass upon presentation of ID. Group rate: From 20 people, applicable outside the school holidays. 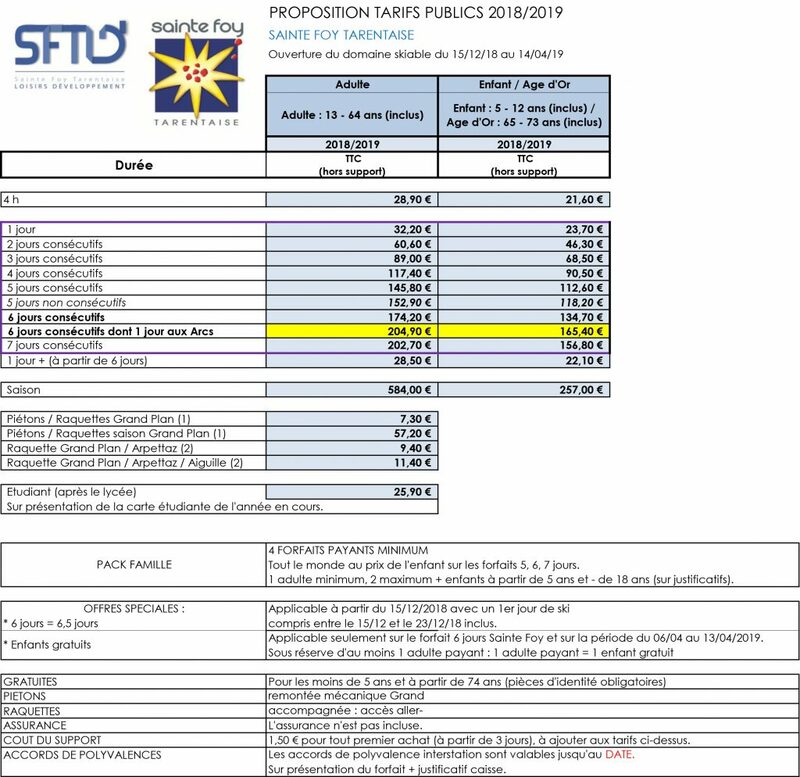 Rate valid for groups from the same company or club upon presentation of a purchase order, after priorly informing the S.F.T.L.D. The lift passes must be bought in a single transaction for a similar duration. For all terms and conditions: click here! Carré Neige offers insurance cover for skiing and all snow sports carried out by non-professionals staying in the mountains. Carré Neige Intégral Annulation offers insurance and cancellation cover for both BEFORE and DURING your stay. Carré Neige Intégral Annulation: €3.60 / per person / per day. This package includes cancellation cover (prior to your stay) as well as the full cover comprised by the Carré Neige (during your stay). Carré Neige Intégral Annulation family pack, from 6 days: €3.60 / per person / per day for all members. This package includes cancellation cover (prior to your stay) as well as the full cover comprised by the Carré Neige (during your stay). For 5, 6 and 7 day Family Packs. * For full terms and conditions, see the Carré Neige leaflet available at the lift pass office. 1 day in the Espace Killy (Tignes or Val d’Isère) at a rate of €31, from the Brévières/Tignes lift pass office or the Funival/Val d’Isère lift pass office. Multiple days in Les Arcs at a rate of €31 + €2 for your lift pass card, from the Villaroger lift pass office (ADS) or the Bourg St Maurice Funicular (SMA), or in Peisey-Vallandry at the Vallandry or Mélèzes lift pass offices (STAG). La Rosière Espace San Bernardo (from Les Eucherts lift pass office) at a rate of €31. 1 day in La Plagne (from the Montchavin-Les Coches liftpass office) at a rate of €31 + €1 for your lift pass card. 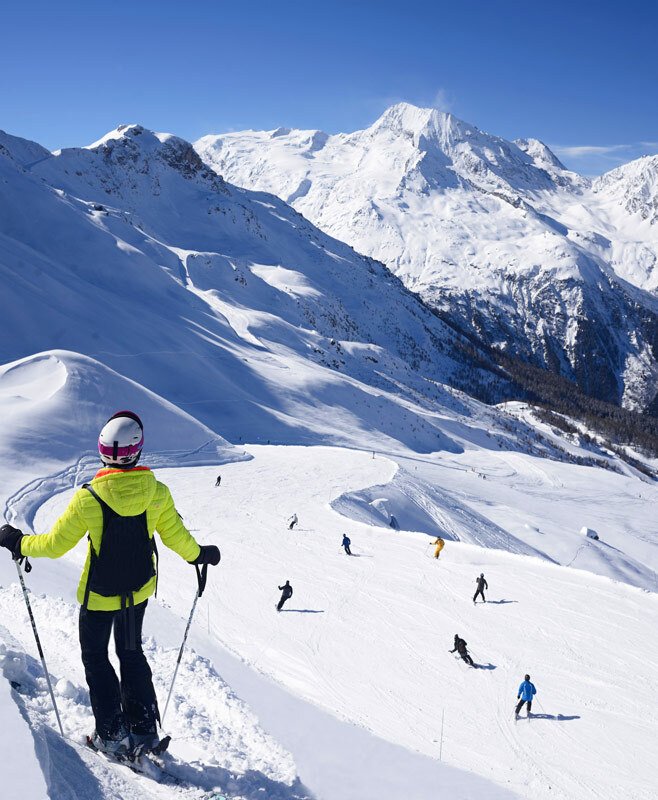 The multi-resort deals are valid from 15 December 2018 to 14 April 2019 for Tignes, Val d’Isere, La Plagne, Les Arcs, and La Rosiere San Bernardo. These deals are subject to the respective snow conditions in each resort. 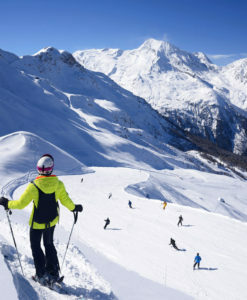 Equally, skiers with a 6-day or more lift pass for the above-mentioned resorts, are entitled to multiple days at a discounted rate of €19.50 per day in Sainte Foy (valid only once for lift pass holders from Tignes and Val d’Isère). N.B. : Presentation of a valid lift pass + proof of sale (receipt) is required. Sainte Foy Tarentaise is located in the Savoie in the Haute Tarentaise, 6 km from Villaroger in Les Arcs, 15 km from Val d’Isère, 13 km from Tignes – Les Brévières, and 16 km from La Rosière. 1 free day in the Espace Killy ski area from Tignes (Les Brévières) or Val d’Isère (Funival). Multiple days at a special rate of €31 per day in the Espace San Bernardo from La Rosière (Les Eucherts). 1 free day in Les Arcs. 1 free day in La Plagne, from Montchavin les Coches. During the winter season, free shuttle buses run between Sainte-Foy town, La Masure, Le Miroir and Sainte-Foy resort. Timetables are available at the Lift Pass Office and the Tourist Office.